By now you've probably noticed that we really like grey and love to pair it with a variety of hues. We've done grey and purple together, we've even done sunflowers once before, but never have we paired all three of these things together... until today! This board was customized for Saira's friend, Ashley! 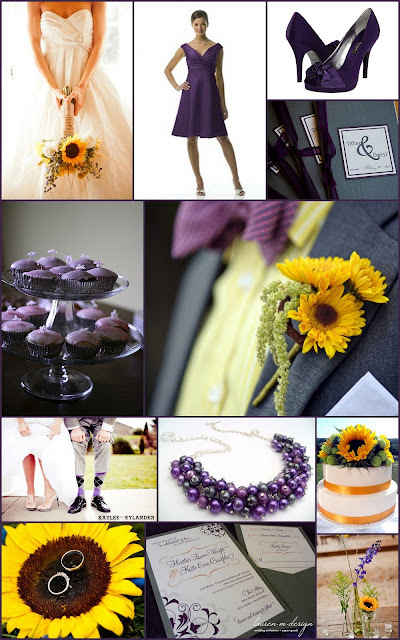 Ashley is using purple as her main color, sunflowers as her flowers and grey as her accent color. Here you can see the tone of the chic and sophisticated combination of purple and grey is changed to a more relaxed and fun feel with the addition of the bright and cheery sunflower. Congratulations, Ashley! Best of luck in your wedding planning! Are you planning a wedding and looking for some inspiration? Send us your colors or ideas and we'll put our heads together to come up with a custom board just for you!